Ekiti state Governor Ayodele Fayose on Thursday set aside political differences and declared the state's support for the federal government's home grown school feeding programme. 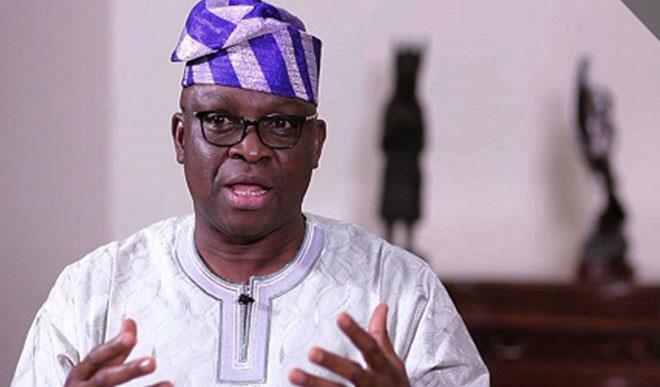 Fayose, who made the declaration in Ado Ekiti while declaring open a two-day stakeholders' workshop for the take-off of the programme, said he decidedto support the programme because it was in tandem with the state's stomach infrastructure policy. The governor, who was represented by the Deputy Governor, Prof. Kolapo Olusola, however, said the state decided to key into the programme following a feedback from government's agencies that studied the programme that the programme would be of immense benefit to the people of the state. He said, "The study revealed the potentials of the programme to improve the nutrition status of the pupils, increase schools' enrollment and attendance, energise the local economy and empower certain segments of the population. "We have decided to set political differences aside and partner with the federal government for the benefits of our pupils. Our participation will be a boost to our efforts to restore the glory of education in our dear state. "The governor, while calling on all stakeholders to ensure diligent implementation of the programme, also promised that the state would give all the needed support to actualise "our collective goal of feeding the pupils. "The Team leader of the programme from the Office of the President on National Home Grown School Feeding Programme, Mrs. Abimbola Adesanmi, said the programme had been introduced in 21 states adding that the programme would improve the health and nutrition of children as well as improve the local production of agricultural products in the state. "It is the plan of the federal government that all states key into the programme for the benefit of allour children in public primary schools. "Attendees of the workshop include officials from NGOs, Community Based Organisarions, Farmers' Congress and representarives of Ministry of Agriculture among others.